Special Gifts > 24k Decoratives Gifts. 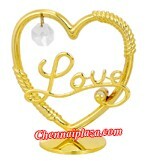 Item Description Sweet looking 24k gold plated decorative Heart shape show piece with a "Love" message, studded with a piece of worlds finest swarovski crystal, measures about 8cm x 7.5cm. 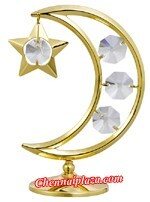 Item Description A sweet looking 24k gold plated decorative showpiece having Moon and a Star motif, studded with 4 pieces of worlds finest swarovski crystal, measures about 9cms x 7cms. 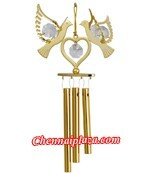 Item Description Sweet looking 24k gold plated Dove birds on wind chime decorative show piece, studded with 5 pieces of worlds finest swarovski crystal, measures about 14cms x 7cms.